As you may know, the District Council has to compile the electoral register from scratch each year and this starts with the annual electoral canvass in late summer/autumn. This week, we have sent out more than 56,000 Household Enquiry Forms (HEFs), one to each property in the district. The forms have pre-printed information on them of persons at each property who are on our system as being registered to vote. The object is that the forms are returned to us with any changes clearly highlighted. For those households where there are no changes, we need to know this, so residents are being asked to let us know by text, phone, website or by just returning the form saying “no changes”. Details of how to respond are on each form. Where there are changes e.g. new people have moved into the property, once we receive the HEF back we will sent each of the new people a separate form for them to register individually (they can also do this on-line). The District Council is undertaking consultation on the Gaydon/Lighthorne Heath (GLH) – Supplementary Planning Document (SPD). The initial draft SPD went through an informal consultation in February/March 2015 to involve local communities and stakeholders in the preparation of the document. The document was updated following the feedback received and endorsed by The Cabinet on 30 November 2015 for public consultation as part of the ‘Formal’ stage of SPD preparation. The consultation document can be viewed on the District Council’s website www.stratford.gov.uk/glh-spdformal. It is also available to inspect at the District Council offices – Elizabeth House, Church Street, Stratford-upon-Avon CV37 6HX and in Libraries at Harbury, Kineton, Southam and Wellesbourne. How to Comment Comments are invited on any aspect of the SPD. · by post to: FREEPOST RSLH – ZYKJ – TYAZ, Stratford on Avon DC, PO BOX 5341, Stratford upon Avon, CV37 1LE – or handed in at the District Council offices in Stratford-upon-Avon. Please note that comments on the inclusion of Proposal GLH in the Core Strategy, or on alternative sites, are not relevant at this time. The SPD is being progressed in tandem with the Core Strategy examination process. Further Examination hearings into the Core Strategy are taking place in January 2016 and the Inspector’s Report will follow. The SPD can only be adopted by the Council if the Core Strategy is adopted with Proposal GLH included. If that is the case, the Council at that point would be able to adopt the SPD without delay. Comments must be received by the District Council by 5.00 pm on Thursday 26 February 2016. At the meeting of full council, on Thursday 3 September, decision was taken not to join the group of local authorities planning to form a combined authority for the West Midlands. Warwickshire does not enter into the West Midlands Combined Authority as proposed but continues to support and pursue the Coventry-Warwickshire Combined Authority as its preferred devolution model. That any future proposals and recommendations for a model of devolution should be subjected to the widest possible consultation with the citizens of Warwickshire before any final decisions are taken by this council. “The Council felt strongly that joining the West Midlands Combined Authority would not be in the best interests of our residents, which always has to be our primary concern and focus. “Joining the Combined Authority would mean being expected to transfer the relevant function – and funding, relating to economic development, regeneration, transport and skills to this new body – and for this new body to either hold and administer these functions instead of the member authority, or to do it concurrently with the member authority. This undoubtedly would not be in the best interests of our residents. 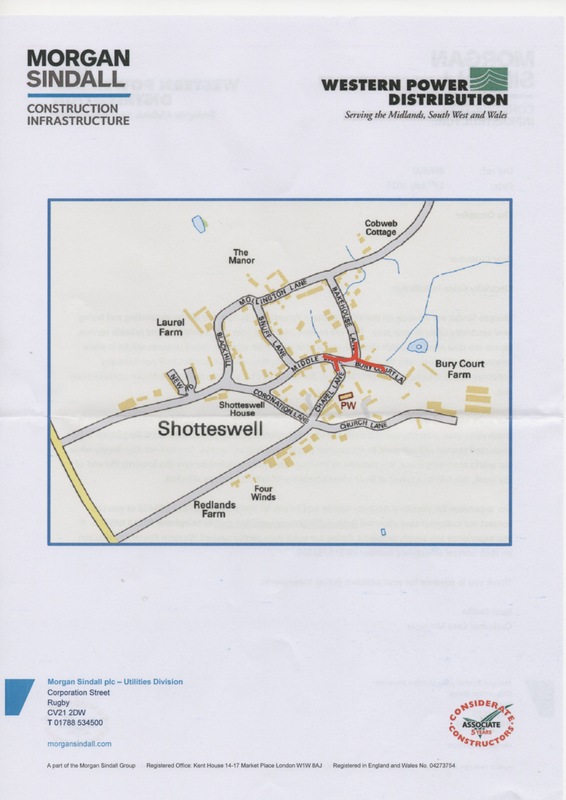 During the month of August, extensive electrical works are to be undertaken in the village, which will necessitate some road closures. 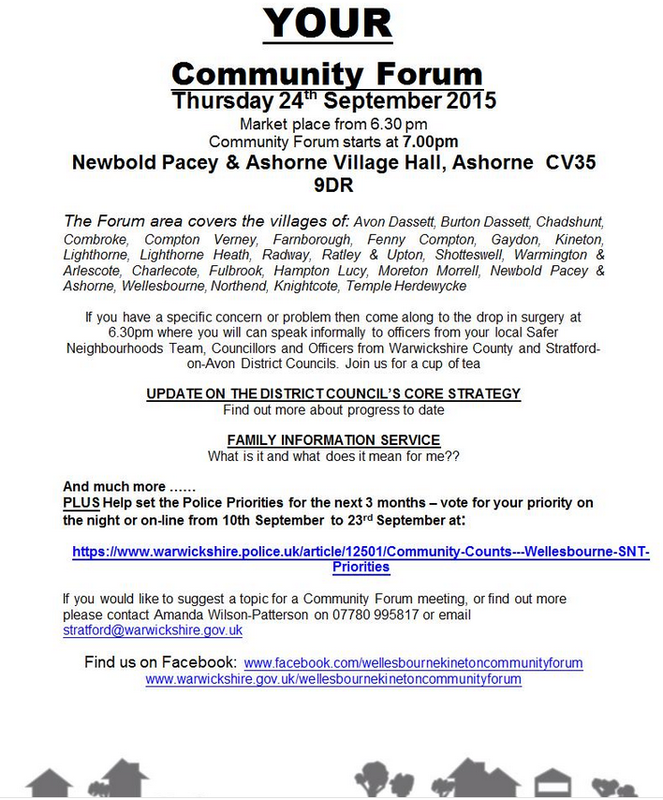 This will have an impact on most of the village at some point due to the redirection of traffic, but will affect properties predominately in Middle Lane, Chapel Lane, Bakehouse and Bury Court Lane. The Parish Council was concerned to hear the proposal to close all of the aforementioned lanes completely for a month. However, following a meeting with Western Power and with the assistance of WCC we have negotiated instead a staggered/phased process of road closures, to minimise disruption to our residents. Although there will be a couple of days where unavoidably all of the lanes will be closed, this will not be until towards the end of the project. Arrangements are in place for residents affected by the road closures falling on Wednesdays to have their bins taken to a collection point and after emptying returned to the respective properties. Alternate arrangements for access for residents in Bury Court Lane have been made and householders contacted directly over these arrangements. Western Power’s workforce will not arrive much before 8.30/9am and normally finish around 3pm, access to frontages will be maintained wherever possible. 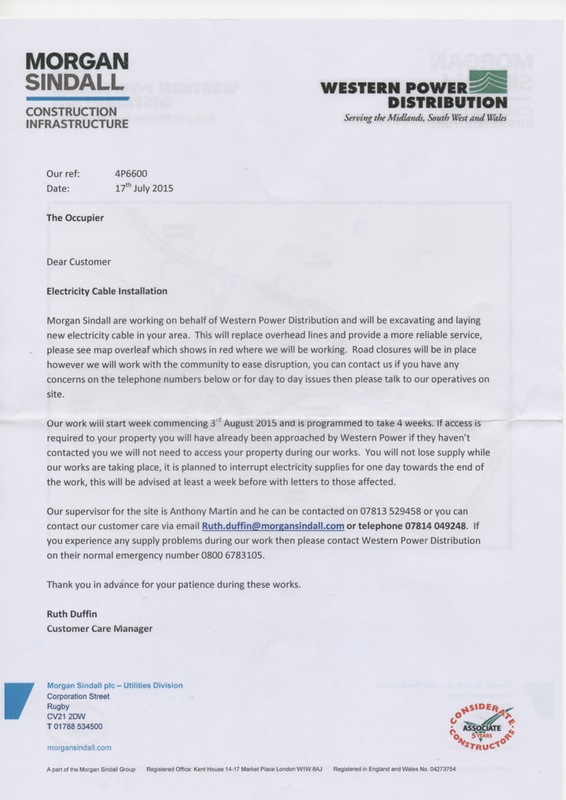 It would be helpful if you can please ensure that any delivery or utility services are advised of the various road closure periods and to please try to avoid deliveries if possible during this period. A letter with contact details and further information including the start date, which is expected to be 3rd August, will be sent to householders in the next couple of weeks. In the meantime if you would like any further details please contact the Clerk (Val Ingram) on 01295 730203 who will be happy to answer any queries. Other News: We have confirmed with Stratford District Council that the bin collection day will remain on a Wednesday. There may be a slight tweak to the time of collection, but this will be notified in due course if there is. The rearrangement of the rounds is to allow for all the new housing that is or is about to be built across the District. Wind Turbine at Mollington: Representatives from the Parish Council accompanied the Planning Inspector on his site visit on the 24th June, this involved visiting Shotteswell, Mollington, Hanwell, Warmington and Farnborough and took five hours to complete. Thank you to the residents who allowed us access to their properties during the visit. It will be some weeks before the Appeal decision is known. 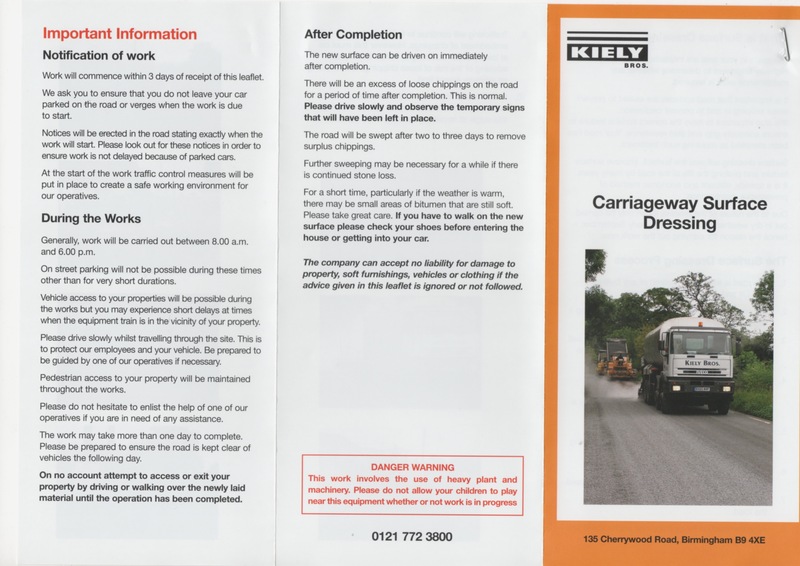 Road Works: Resurfacing of some of the roads will take place on 20th July please ensure that cars are moved on this day to allow access for the highways team. Some white lining has taken place in advance of this work, this was not an oversight, lines will be masked during the resurfacing process. 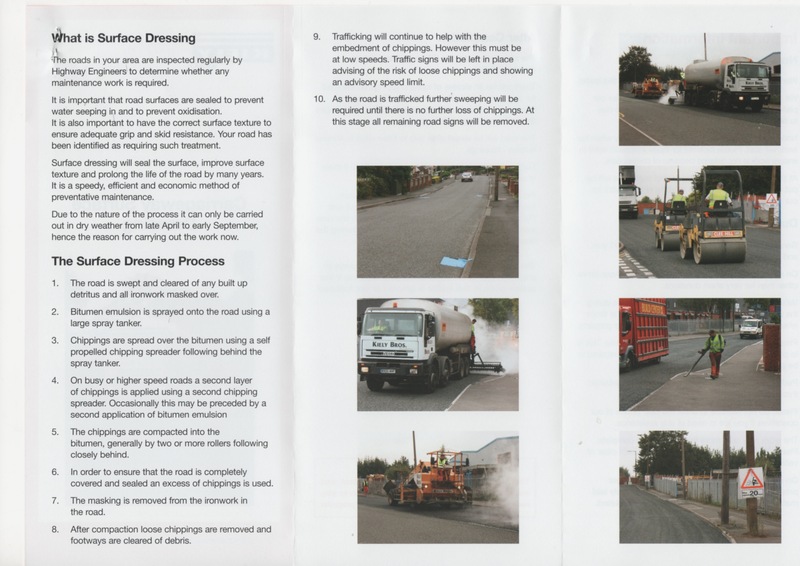 This is to ensure that the junctions are clearly marked to avoid any potential accidents should inclement weather prevent the lining team following immediately behind the road resurfacing team. Superfast Broadband: We are delighted to inform you that superfast broadband is coming to some parts of Shotteswell soon! Cabinet Wroxton St Mary 5 is now scheduled for upgrade meaning that many properties connected to it may soon be able to order superfast broadband from their internet service provider. The new cabinet has been installed and the works to link it with the exchange has begun, we do not have a definite date as this will be subject to any problems they may encounter such as blocked ducts etc. As we have previously mentioned you will need to contact your service provider to order this service. The Parish Council will let you know as soon as we hear when the cabinet is about to go live, more details to follow.